Hello short nails, Manicure Monday! I've managed to keep my promise this week! And this week's nails are quite special because I am wearing a nail art! Well not one of those gorgeous yet complicated nail art that you usually see, but I am proud that I have made it myself! Plus, if you are a regular reader of this blog, you may actually know how I am usually ranting about having a busy schedule, and for the nth time, I will say, I am not complaining, just plain rant. That just explains how big deal it is for me to find time for such things like nail art. Lol. Now back to my nails, look at my cutie piggy nails! I am staring at my little nail polish collection the whole morning yesterday undecided on what color to wear this week. Until I've decided to go girly in pink but having them in different shades just caused me another confusion! /simpleyetcomplicatedgirlproblems From there, I thought of choosing at least 2 shades and create a simple nail art out of it. 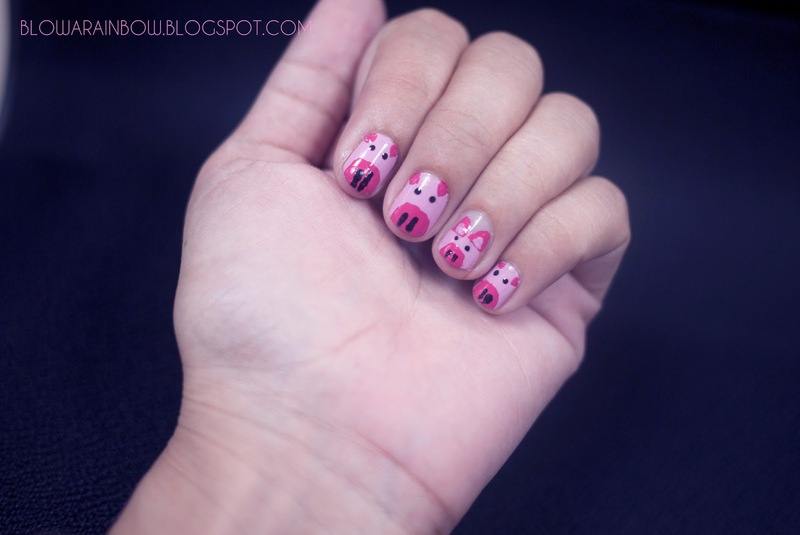 There comes the idea of having these cutie pigs on my nails! Just a few curves, dot and line and you will achieve it! To those who are still curious on how to do this, I created a simple tutorial below, hope this helps! 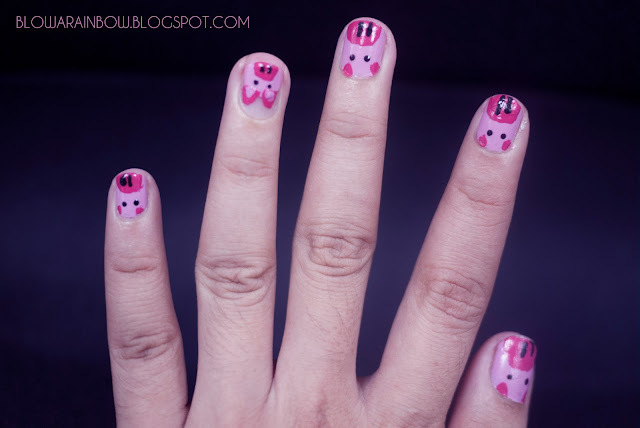 Plus, I have realized that it is better to wear your nails short if you will be doing a nail art. Long nails fit a one color/plain manicure only. Just a simple tip! 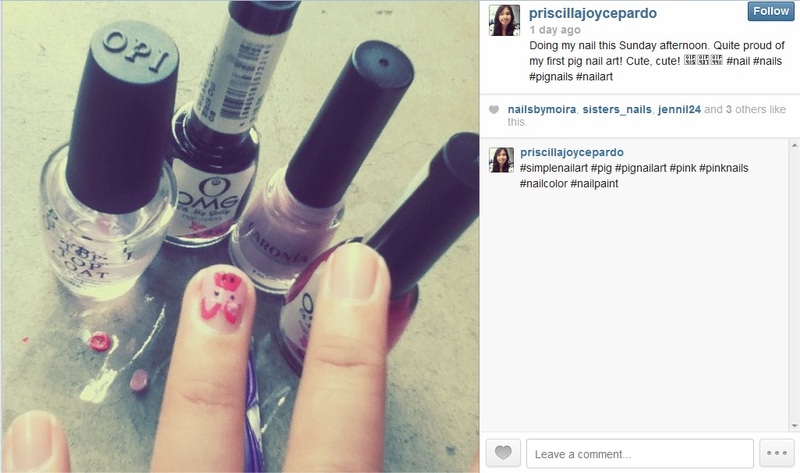 I used this Caronia Rosy Glow nail polish as the base color for this manicure. This was from the Caronia Expressions collection that they've generously sent me last summer. I forgot to include this when I shot my nails but here are what I've used for this manicure from my Instragram post yesterday: Oh My Golly nail polishes in Bikini and Black Out; Caronia Rosy Glow; OPI Top Coat and OMG nail dotter. If you haven't yet, follow me on Instagram @priscillajoycepardo! those are so absolutely adorable! Hahh I love these! 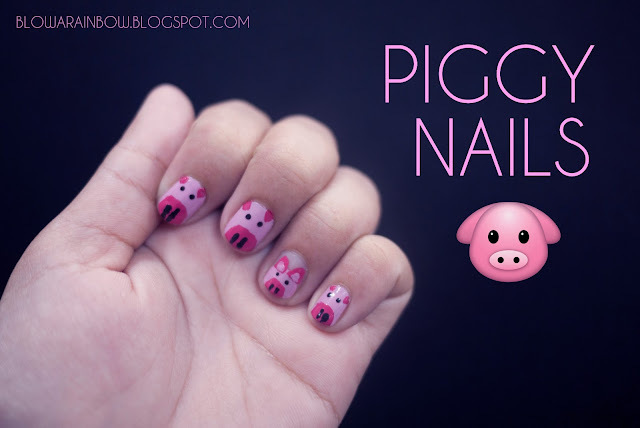 I'd be so tempted to do a "Old McDonald" style hand with piggys, Moo cows & Chicken nails! Oh my gosh, this is SO SO cute. I love it! oh que simpaticas, me encanta !! I have moved my old blog, Just Another Day, to a new space, now called Neon Blonde! I would appreciate it if you could check out and follow my new blog!